The first trailer for the animated feature Dorothy of Oz has been released. 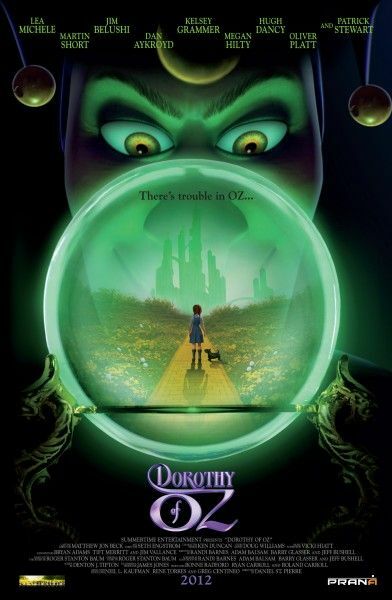 The CG-animated musical centers on Dorothy (Lea Michele) returning to the Land of Oz, only to find that the kingdom and its inhabitants are in grave danger from a wicked Jester (Martin Short). The low-budget film comes from the studio Summertime Entertainment, and the visuals are sadly a far cry from Pixar or DreamWorks Animation. That said, the colorfulness and strange cast of characters would have been a big pull for me as a kid so maybe this will play better to younger audiences. The film is almost reminiscent of the dark and twisted unofficial sequel Return to Oz, but with decidedly more singing/Broadway stars. Hit the jump to watch the trailer. The voice cast also includes Dan Aykroyd, Kelsey Grammer, Patrick Stewart, James Belushi, Bernadette Peters, Hugh Dancy, Megan Hilty, and Oliver Platt. Dorothy of Oz will open sometime in 2013.